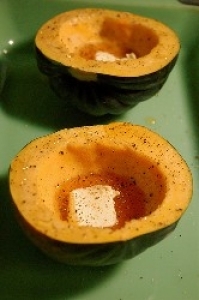 Have you made Acorn Squash Soup? 1. Kale leaves Paprika Cut squash in half lengthwise, and remove seeds. 2. 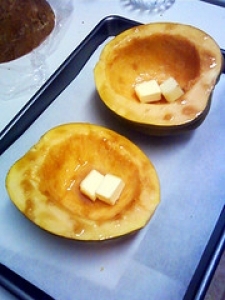 Place squash, cut side down, in a broiler pan. 3. Add hot water to pan to a depth of 1 inch. 4. Bake at 350 F for 30 minutes. 5. Spoon pulp from squash to create a serving bowl, reserving pulp. 6. Place carrots and onion in a saucepan; cover with water. 7. 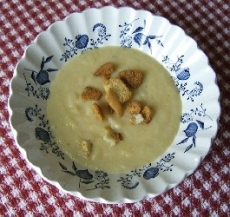 Bring to a boil; cover, reduce heat, and simmer for 15 minutes or until vegetables are tender. 8. 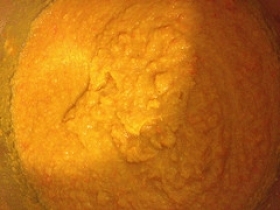 Drain; combine vegetables with reserved pulp and 1/3 cup water in container of an electric blender or food processor. 9. Process for 30 seconds or until mixture is smooth. Set aside. 10. 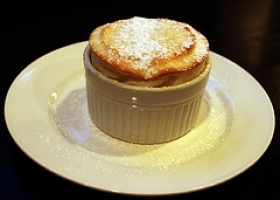 Melt butter in a large Dutch oven over low heat; add flour, salt and pepper, stirring until smooth. 11. Cook for 1 minute, stirring constantly. 12. 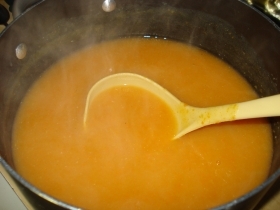 Gradually add pureed vegetable mixture, chicken broth, and next 5 ingredients; bring to a boil. 13. Cover, reduce heat, and simmer for 1 hour, stirring occasionally. 14. Stir in half-and-half and, if desired, 1 1/2 Tbsp sherry. Cook until heated. 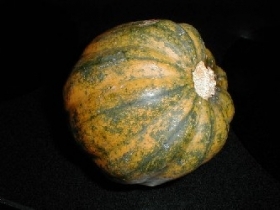 If desired, serve in squash shells on a bed of kale. Sprinkle with paprika. This recipe is high in Vitamin A with 69% of your daily recommended intake per serving. This recipe is high in Vitamin C with 42% of your daily recommended intake per serving. 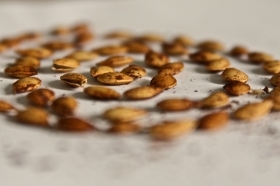 This recipe contains potential food allergens and will effect people with Wheat, Butter, Gluten, MSG, Poultry, Sulfites, Alcohol, Onion allergies.